It's probably the character "²" that is missing in the font you chose. If you can ,then not find "²" in the font,specify a default "²" would be better. I wanted to release Sweet Home 3D 5.0 tonight, but can't tag the version in the source code and can't upload installers on SourceForge.net because most of their services have been down for almost one day! That's why I prefer to host the released files on sweethome3d.com for the moment. Once SourceForge.net will be repaired, I'll upload these files there and will make the release more official on sweethome3d.com. Thank you once again for a great job !! 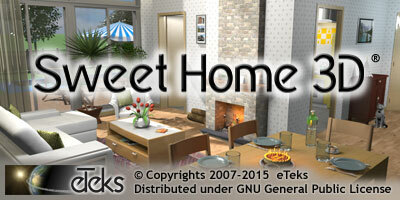 As upload service won't still be available on SourceForge.net before a while, I officially released Sweet Home 3D 5.0 files on sweethome3d.com tonight. Released files will be copied at SourceForge.net, once their service will be back. Note that the files I released two days ago were updated under the same name at 19:23 CEST on July 19, to fix a bug I found on the visibility of doors and windows in layers lower than the one they belong to. Sorry for any inconvenience redownload may cause. Thanks for your tests and your great support! great piece of software by the way! Do you have any idea when the portable version of V5.0 will be made available? Probably not before mid August. The missing data are some sh3l additionnal translations that contributors might have difficulties to update because of SourceForge problems with CVS and other repository features. But you can update the existing portable version 4.6 to 5.0 by yourself: download one of the Linux installers of version 5.0, uncompress it to get the lib/SweetHome3D.jar file it contains, then replace the file with the same name in the portable version with the 5.0 version file you extracted. That's all! Merci beaucoup pour cette technique d'upgrade manuelle !